BOSTON, August 31, 2018 – We are in contact with textiles for up to 98 percent of our lives, and they are starting to become intelligent. Part of this revolution includes the integration of electronics and textiles. Electronic textiles (e-textiles) have been in development for decades, but have begun to achieve some commercial successes in the last 20 years. Today, while e-textiles markets remain in relative infancy compared to their parents, many industry players are lining up to offer the next generation of smart textile products. From clothing to bandages, bed linen to industrial fabrics, new products are appearing throughout a variety of verticals as this technology area is increasingly explored. 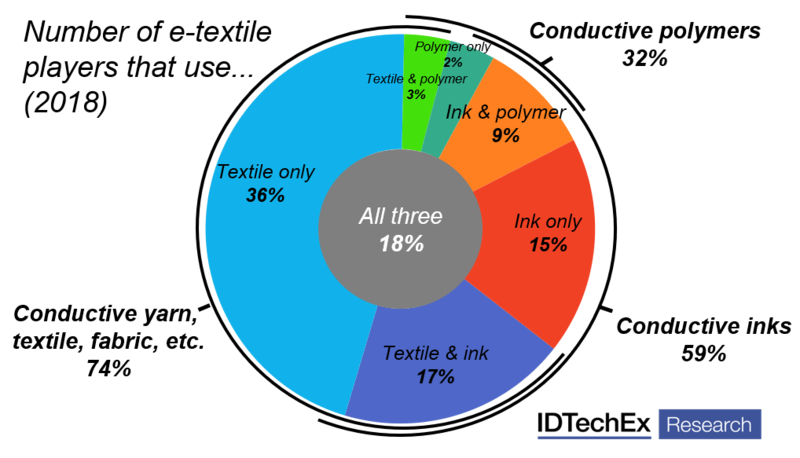 The recently updated report from IDTechEx, E-Textiles 2018-2028: Technologies, Markets and Players, provides an extremely comprehensive overview of the entire electronic textiles ecosystem. With research over the last 5 years, IDTechEx analysts have compiled details about the entire value chain, revenue data by product type, comments on future market development and forecasts from 2018-2028. The report also includes a list with details of nearly 150 companies and primary interviews with executives and technology experts in over 40 of these players.